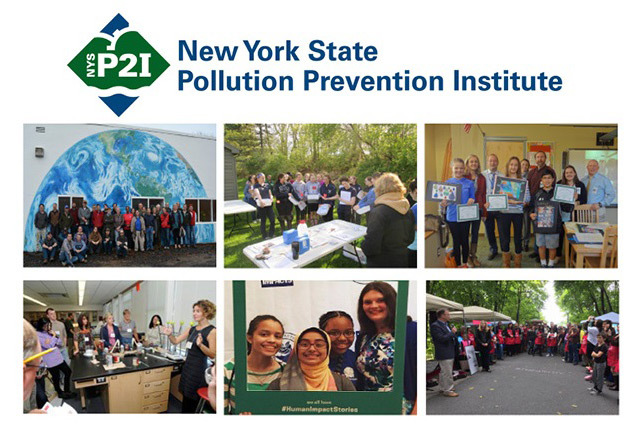 The New York State Pollution Prevention Institute (NYSP21) has announced awardees of its 2019 Community Grants Program as part of the organization’s ongoing efforts to continue improving the health and environmental quality of New York state. NYSP2I—sponsored by the New York State Department of Environmental Conservation through the Environmental Protection Fund and led by Rochester Institute of Technology’s Golisano Institute for Sustainability—is funding proposals from 13 organizations statewide. Now in its 11th year, the Community Grants Program provides nonprofit organizations, academic institutions and local governments both financial and technical assistance for projects that promote and implement pollution-prevention practices at the community level. The Art Effect, Poughkeepsie, N.Y. The “Creativity and Connection at the Fall Kill Creek” project engages low-income youths and community residents who live alongside the creek to increase their knowledge about environmental harms. Youths will research, clean and monitor two sites; implement public-education campaigns; and design and install public art encouraging residents to become ambassadors for the environment. The Buffalo Zoo, Buffalo, N.Y. “Teaching K-12 Pollution Prevention through Video, Art and Sciences, Phase II” will build on the organization’s previous Pollution Prevention Institute grant through an art project—including rain barrel painting and single-use plastic bag art—by increasing student participation in the program and adding an informative video program. Capital Roots, Troy, N.Y. The “Youth Empowerment for Community Change” project aims to provide environmental justice neighborhoods with innovative food access and education programs that reduce the impacts of poverty, poor nutrition and lack of access to healthful foods. The organization’s job-readiness and youth leadership program trains students in data collection, public-health education and community engagement. Children’s Environmental Literacy Foundation, Valhalla, N.Y. “Citizen Science in NY School Communities” will engage New York public school students as environmental health researchers to collect, analyze and compare air-quality data from their neighborhoods to identify the sources of air pollution, connect the sources to human behaviors and then develop prevention plans for their communities. Clean and Healthy New York, Albany, N.Y. “Reducing Toxic Chemicals through Local Procurement” will conduct research needed to develop materials summarizing chemicals of concern in food service ware and create awareness about chemical hazards in food service ware, identify safer alternatives and promote nontoxic packaging. Corn Hill Waterfront and Navigation Foundation, Rochester, N.Y. “Environmental Education on the Erie Canal” aims to position the Erie Canal as a testbed for STEM education by educating teachers, students and the community to raise the public’s awareness about sources and effects of water pollution. Gowanus Canal Conservancy, Brooklyn, N.Y. “Gowanus Blue Schools” will implement a program and STEM curriculum model that will address issues caused by Combined Sewer Overflows (CSOs). Students will design comprehensive green infrastructure proposals on environmental justice topics and then present them at a final competition. Healthy Baby Network, Rochester, N.Y. “Environmental Reproductive Wellness for Black Women” aims to create a community-driven health education series targeting black women and girls with respect to personal care products and the development of a steering committee to champion black women’s environmental wellness. Hudson River Park Friends, New York City. The “Hudson River Park Community Compost Center Program” will support and enhance its existing Community Compost Program by recruiting additional volunteers, sustaining and increasing the number of area compost programs and extending outreach to parks and municipalities. Hudson River Sloop Clearwater Inc., Beacon, N.Y. The “Microplastics Pollution Prevention Project” will focus on training teachers in environmental justice communities after previous experience showed greater potential impact in training educators who can deliver the curriculum directly to their students, multiplying the impact of their work. Onondaga County Resource Recovery Agency, North Syracuse, N.Y. The “Cafeteria Food Scraps Recovery Educational Video” will produce a professional, educational video to train students on how to implement a school-wide cafeteria food scraps recovery compost program and explore why it’s beneficial to do so. Rockaway Waterfront Alliance, Far Rockaway, N.Y. “Living Classroom” is a series of hands-on experiential learning workshops that will grow students’ sense of environmental stewardship and their role in reducing pollution, with a goal of behavioral change in diverting trash to recycling and compost. SU Center for Sustainable Community Solutions, Syracuse, N.Y. The “Save CNY Wasted Food” project aims to increase support for local food-recovery efforts that work to aid those facing food insecurity by engaging, educating and empowering Central New York residents about food waste, food insecurity issues and food waste prevention practices they can adopt. Since its establishment, NYSP2I’s Community Grants Program has supported 100 projects throughout New York state with grants totaling more than $1.5 million. Past projects have included green chemistry workshops for high school students and teachers; homeowner education encouraging environmentally conscious practices; and food waste diversion and education projects. The next Community Grant Program request for applications will be announced in late spring of 2019. Go to http://www.rit.edu/affiliate/nysp2i/community-programs/community-grants for information. Sponsored by the New York State Department of Environmental Conservation through the Environmental Protection Fund, the New York State Pollution Prevention Institute is led by the Golisano Institute for Sustainability at Rochester Institute of Technology, and is a partnership between RIT, Binghamton University, Clarkson University, Cornell University and Rensselaer Polytechnic Institute. NYSP2I also works with the New York Manufacturing Extension Partnership to help disseminate data and strategy. NYSP2I’s goal is to make the state more sustainable for workers, the public, the environment and the economy through pollution prevention. Pollution prevention is reducing or eliminating waste at the source by modifying production processes, promoting the use of nontoxic or less-toxic substances, implementing conservation techniques, and reusing materials rather than putting them into the waste stream.